This article is reprinted with permission from the 21 July 2007 issue of The Tablet (https://www.thetablet.co.uk). It is now a few months since a number of new Catholics (neophytes) were received into the Church at the Easter Vigil, and, with the period of post-baptismal catechesis (or mystagogia) now finished as far as the parish process is concerned, it is time for parishes to re-evaluate the process and look ahead. I was surprised to hear from a woman who was received a few years ago that she now doesn’t come to Mass any more. Her parish is known for being a welcoming and active parish and the Rite of Christian Initiation of Adults (RCIA) team is friendly. She told me how the highlights of her journey in faith had been the Rite of Election and the Easter Vigil and she talked about how enthusiastic she had been on experiencing the teachings of the Church and how to live them out. She said that the parishioners had been very encouraging to her during the whole process; but, she said, this changed after the Easter Vigil. She told me that she felt absolutely elated at her baptism- full of hope and expectations of what it was going to be like in her new “spiritual home” and she could not stop talking about it. Only a few weeks later, however, she felt isolated and abandoned; the community appeared to show no further interest in her. She struggled for four years, and then just gave up. The RCIA reminds us that “the entire community must help the candidates and the catechumens throughout the process of initiation” (RCIA #9). After my conversation with this woman, I had to ask myself when people think this process ends. Perhaps they think that, after the baptism at the Easter Vigil or after the post-baptismal catechesis at Pentecost, the neophytes are fully initiated members of the community and they no longer need to be invited to join in any parish activity. How different it might have been for this woman if the parish had a “new Catholics” group — where they could continue to meet until they had gradually become involved in the activities of the parish. A major concern expressed by priests, catechists and sponsors alike is why so many people who seem committed to taking this step on their faith journey then fall away from practice (or, to use the more common term, lapse). The figure is thought by some parish priests to be about 20 per cent. 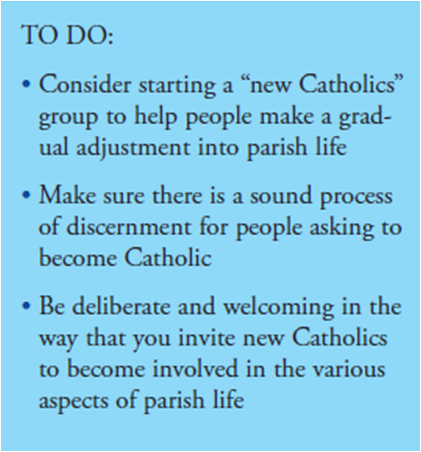 Maybe we should begin by asking why the vast majority of new Catholics stay — and appear to settle happily in our parishes and engage energetically in the mission and ministry within the parish. Indeed, it is widely known that their contribution to the life of the local and wider Church is immense. A recent study undertaken in the Plymouth Diocese considered these questions. Interviews with more than 30 “new” Catholics who had been received into the Church between four and 15 years ago revealed interesting responses. All of them confirmed that they had valued the RCIA process. Most of them found the parish congregation encouraging and interested. Only one interviewee felt that the sessions included too much doctrine; and only one felt that there was too little doctrine. Candidates found it encouraging to be asked to share their faith journey with the catechists and sponsors. They responded favourably to hearing the beliefs and teachings of the Church. When we spoke to those who now feel they belong to the community each one was keen to stress that the inclusive spirit of welcome both during and after the process had been of paramount importance and was, in fact, the overriding factor in their settling into the community. Many of them had become engaged in parish ministry or in some activity ranging from taking a turn on the tea and coffee rota to being ordained to the permanent diaconate. Having interviewed a number of the lapsed “new” Catholics, it would appear that the reasons for their not practising are many and varied. One woman we spoke to was in her early 30s. She had married young; she was expecting her first child when her husband of a few months left her. She never saw him again and the marriage ended in divorce. With her son later at a Catholic primary school, she was drawn to and later initiated into the Catholic Church. Some eight years later, she met someone, and wanted to marry him. Realising the difficulty she faced, she approached her parish priest; but he had no time to see her. After two more unsuccessful attempts, she was never seen again at Mass. A more uncommon dilemma is when one partner in a marriage decides to become Catholic — but without the full consent of their non-Catholic or anti-Catholic partner — only to discover later that the fact of coming to Mass on a Sunday drives a wedge in their marriage. These cases may sound extreme; they are just a few of the situations that the local study uncovered after interviewing people who had lapsed. The most overwhelming reason for not settling into the Church was the lack of welcome from the parish community. According to the people interviewed, the adjustment from being part of a small intimate RCIA group into being part of the larger parish community was like being thrown to the lions. Some felt that we invite them to the feast but forget the after-dinner conversation. No questions were needed to prompt these people to explain why it had not worked out for them and to hear them express their sadness. They were seemingly anxious to help the Church get it right in the future. A few had returned to their previous denomination; others were disillusioned, angry and hurt. In conclusion, we believe that we have to ask ourselves some uncomfortable questions about how we welcome people and how we invite people to be involved in our parishes — especially when it concerns those we meet on the threshold. Susanne Kowal is the former Coordinator of Adult Initiation for the Diocese of Plymouth in England. She is currently a primary contact person for the Catholic Enquiry Office managed by the Catholic Bishops’ Conference of England and Wales. The Catholic Enquiry Office hosts the website Life4Seekers (www.life4seekers.co.uk/).